OSWEGO – The Children’s Museum of Oswego (CMOO) is pleased to announce that it has been awarded a $250,000 grant from the Shineman Foundation for the Build, Play, Grow Campaign. 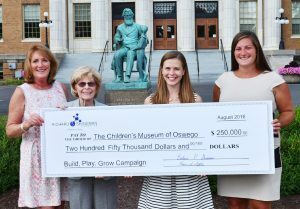 Karen Goetz and Barbara Shineman of the Richard S. Shineman Foundation present Jillian Shaver and Jenny Workman of the Children’s Museum of Oswego a check for the Build, Play, Grow campaign. The funding will be used for the design, fabrication and installation of one of CMOO’s planned signature exhibits, the Cloud Climber. The climbing exhibit will span two floors, encourage active play and physical exercise as well as allow children to explore what it might be like to climb inside a cloud and learn about our region’s unique weather patterns. 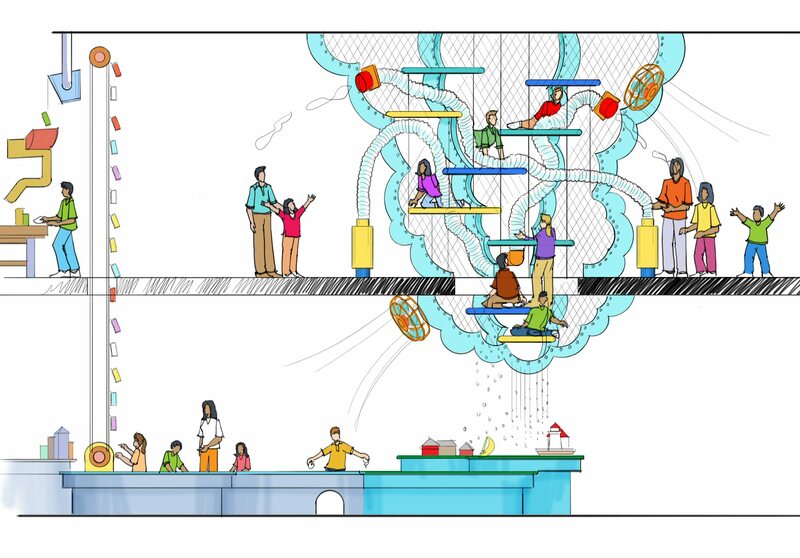 Visitors will also be able to climb down to overlook the first floor and control various aspects of weather, such as wind, which will give power to sail boats being built by children at the water table on the first floor. To date, the museum has raised $730,830, more than 60 percent of its Celebration Goal of $1.2 million. The Build, Play, Grow Campaign stems from the museum’s strategic plan to expand exhibits and provide year-round learning and recreational opportunities for the benefit of children, families, educators and caregivers. The museum will host “Cocktails and Conversation” at its 7 W. Bridge St. location on August 15 at 5:30 p.m., August 23 at 7 p.m., August 28 at 2 p.m. and September 8 at 6 p.m.
All are invited to attend to learn more about CMOO’s Build, Play, Grow Campaign. Please RSVP to [email protected] indicating the date you will attend.